The little crafter show: Mix media Monday. Yep I am back for a little while, doing mix media Monday. Since I been working on other projects and pressed for time I bragged a ranger mix media journal in the smaller size for today's project. I always inspired by Olivia my niece. 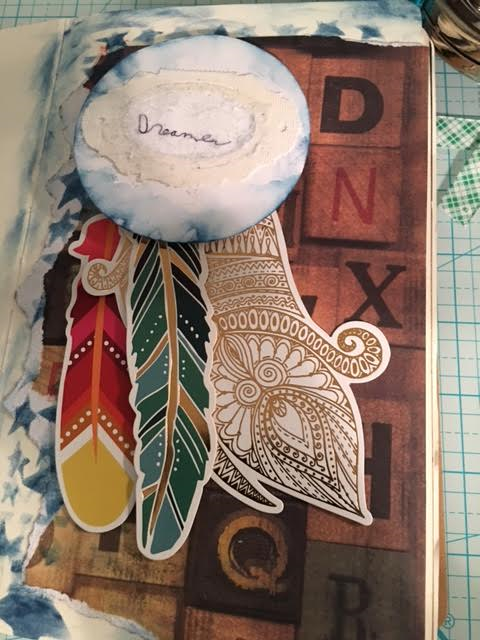 We share a love for dream catchers and that is what I came up with for this today's page. A small Ranger mix media journal, any journal will do I just happen to seen tis one first and used it for today. scrapbook paper, mine was from a Tim Holtz collect but any paper will do to build a background. Plate Knife that I got at Michele's craft store. I also liquitex ultra mate media gel from there as well. You can these items at an art or craft store by the way. a three inch circle that I cut using a recollection punch but again any punch will do it up to you how big you want your circle or what you on hand. The label that I made using Tim Holtz movers and shapers sizzix Tag and bookplate die which was cut out of stick back canvas, not sure where you can buy that many more but I sure some other craft company make it. I also used a stencil from ranger ink and a make up sponge to apply the ink. The little crafter show: Michaels Haul. The little crafter show: Cricut haul.